When you nickname your garden The Microgarden, as I do, one thing is certain: Abundant space is not a feature. 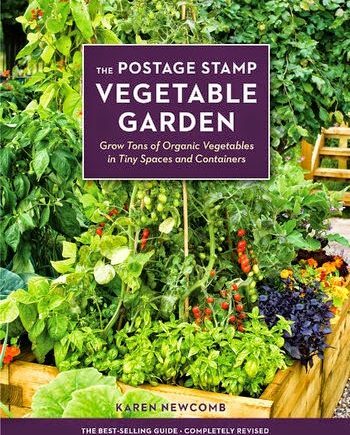 The first is Karen Newcomb’s The Postage Stamp Vegetable Garden that invites you to grow tons of organic vegetables in tiny spaces and containers. This bestseller has already sold a half-million copies, and this edition is completely revised. But in the 40 years since it arrived on the scene, book design has changed. Garden readers who’ve come to expect splashy pictures, cover to cover, won’t find them here. Other than a few spot illustrations, this mainly text. On the plus side, the matte paper does invite marginal notations (if, like me, you’re not only a small-space gardener but an inveterate book defacer marginal notator). While, Newcomb’s definition of “postage stamp” appears less postage-stampy than mine, she does give sound ideas for squeezing more veggies out of less space. Info on common veg includes her postage-stamp “star” rating on how well each suits small-space growing, and she names more-compact or better-yielding varieties. She also suggests ways to stretch your crops such as by interplanting with other veg or repeat sowings. 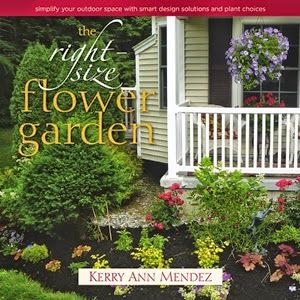 If flowers are more your thing, you might like The Right-size Flower Garden by Kerry Ann Mendez, published by St. Lynn’s Press. The subhead says: simplify your outdoor space with smart design solutions and plant choices. 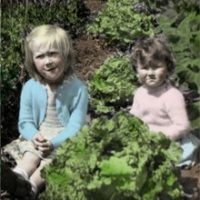 Simplifying our gardens is a common theme as lives get busier, whether because we ourselves are aging or because our families or jobs require more time than we have to give. Mendez’s own journey began when she – an experienced gardener – had to suddenly downscale her garden due to her husband’s accident. The pretty pictures we’re used to are here in Mendez’ book, including befores-and-afters of her own right-sized perennial beds. She also suggests plants for easy care or best use of small space as well as fussy, time-sucking plants to avoid. One thing I could wish for would be a cross-referenced index; not just plant names but topics or problem areas. The table of contents lists general categories (I like her “Design solutions for almost autopilot garden”), but while plants for specific purposes are given in different chapters, there’s no easy way to refer back afterwards. Unless you have a good memory or a plentiful supply of Post-Its. But if you’re wondering how to simplify and where to begin, Mendez will talk you through it like a kind friend. And that, as La Martha might say, is a good thing. Finally, we have Grow a Living Wall from Cool Springs Press. 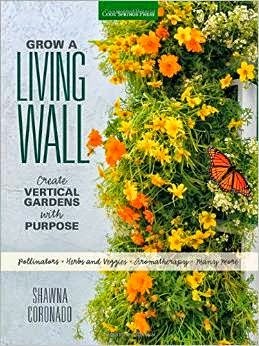 Author Shawna Coronado writes about creating what she calls “vertical gardens with purpose” such as for pollinators, herbs, veggies, or aromatherapy. On the picture scale that seems to be happening in this post, this book the most up(ha ha! )wardly mobile; lots of glossy images, including many of Coronado herself. She includes good how-tos with details such as tools you’ll need and suggestions for different ways to plant your vertical garden. Many of the living wall ideas Coronado presents use commercially available kits that you can modify with different plant material, so there is some repetition. For instance, one vertical wall system from Sage is used four times: with houseplants; as an aromatherapy garden; with cacti; and with succulents. They’re all attractively done, but I wouldn’t necessarily class these as different projects. She does have Pinterest-worthy ideas, though. One mounts multiple cone-shaped hanging containers on a wall, rather than suspending them, and plants them with ferns. Another uses coloured glass mason jars, with holes drilled in the base, to create a hanging herb garden for a fence. Very cute and photogenic. There’s also a cool moss living wall project I’d love to try. Simple projects include the use of self-watering planters on a recycled bookshelf – quite practical for condo dwellers who have restrictions on what they can attach to balcony walls. A living wall is the very definition of gardening within a small footprint. If you want to give one a try, this book would be an easy way to begin. I like the looks of that Postage Stamp vegetable garden. When we build our gardens at the new house the vegetable garden is slated to be postage stamp size. But I will have access to Farmer's Markets!